It’s here! Once again the holiday season is upon us. Our homes will be filled with family and friends joyously celebrating all there is to be thankful for. 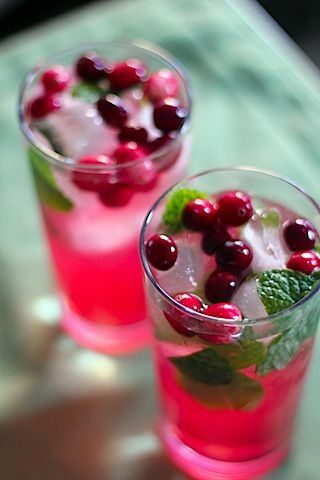 One of our favorites, Holiday Cranberry Mojitos, recipe courtesy of WearenotMartha.com. Follow our pinterest for more holiday ideas! We all know that it is the people who really make the party enjoyable, but I have found that just taking a little extra time to set the stage goes a long way to make our guests feel special. Now is the perfect season for a cocktail or two to help keep our guests merry and bright, or at least full of cheer. Now I’m no Megan Draper, nor do I claim to be quite as adept as any of the men or women of Mad Men when stocking a bar, but I do think I can spot a well designed bar cart when I see one. 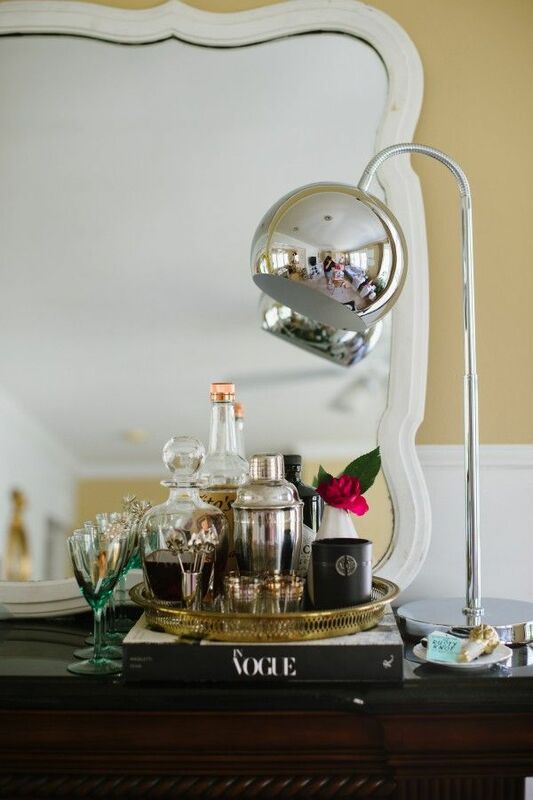 I could probably be spotted sipping a cup of tea more often than champagne, yet bar carts have always held a special interest for me. They are the perfect place to set up a little vignette to set the mood for that special evening. What a delight to see a bar set up right in ones own space…welcoming your guests to help themselves to get the party started. Sooo, we just couldn’t resist getting a few bar carts into our shop. This one from Arteriors is just the right size when you dont have too much space. We loved Worlds Away elegant silver cart for its glamorous appeal… we just adore its X shaped legs. For a rustic wine cellar, we just got in this authentic wine table…. wonder what stories it could tell. According to the mixologists at Food and Wine, the essential spirits to include for any cocktail list are gin, vodka, tequila, whiskey and rum …but I must say just a few pretty bottles go a long way for a visual treat. I happen to love Hudson Whiskey, not only for the taste ( okay, I haven’t actually tasted it yet), but I love the bottle design. Since its bottled in New York, I consider it buying local. 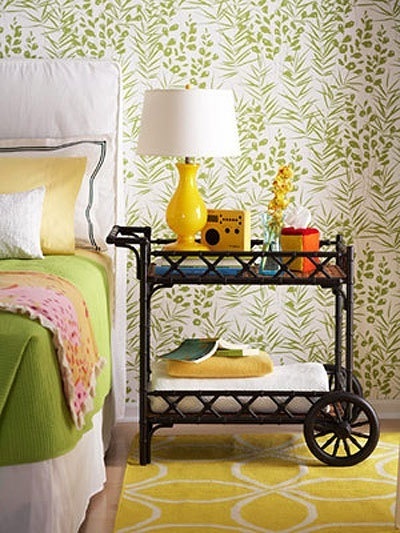 Of course, you don’t have to have a bar cart to set up a welcome center. You can set up an area with a few bottles, a tray, glasses and you are on your way. By just containing all your ingredients..or even just your glassware on a tray it distinguishes this area from others. Style. Contain. Group by size or color. Now you are ready to set the tone for a special evening. Not one to indulge? 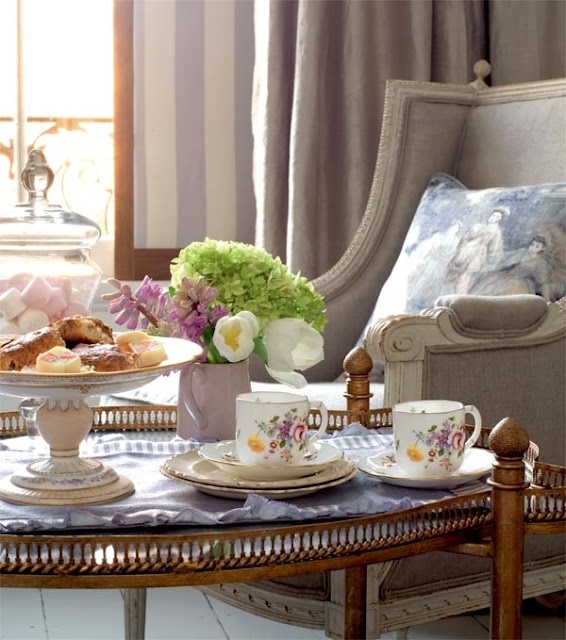 No worries…set up as a tea cart they are just as welcoming, especially during the chilly winter months. Add some deserts and your guests will never leave! 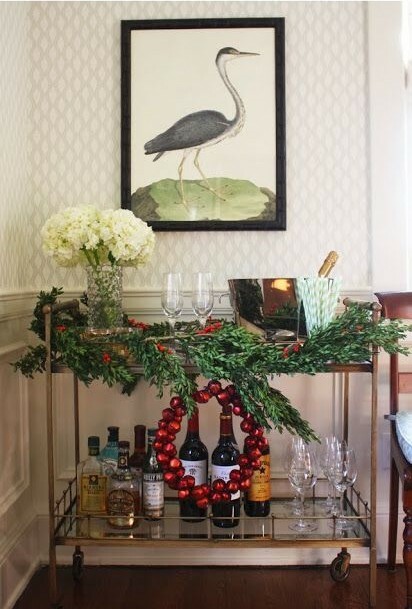 Anything this good looking should be out all year, ones bar cart isn’t just for the holidays. This one could make the perfect side table. Versatility is the name of the game. Hope you come in for a visit. We might just have a drink waiting for you.. This entry was posted in Interior Design and tagged barware by Lifestyles and Interiors by Lisa. Bookmark the permalink.